If you find tuning the guitar a real problem then the korg tuner we’d like you to check out is the Korg DT 10. Learning to tune the guitar without electronic aids is a great skill to have, there’s no doubt about it. In many occasions, though, it helps to have some help in the form of a stomp box. The Korg DT 10 is a low cost solution that is incredibly easy to use. It’s more or less a plug and play guitar effects box. However, there are a couple of things you should also know about guitar tuning devices. 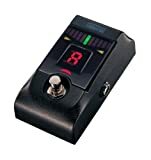 One thing that you need to watch out with when buying or using a guitar tuner is if it’s chromatic or not. Cheaper units are actually tuned into the guitar strings as set E-A-D-G-B-E. This is fine for most musical scenarios, but it can be limiting. For example, what about a drop D tuning? Or, what if you want to play with altered tuning. There can also be problems with non chromatic tuners if for example, you are closer to one note than the other. It will give a false reading to a note that you are not actually trying to tune. GMI – Guitar & Music Institute guitarist Gary Clinton demonstrates exactly how to use this Korg DT 10 tuner. He gives you plenty of advice about using the device as well as some insights on how to get the most from it. This HD video lesson is part of a series of lessons within the course Pedal Power. Created by GMI, Pedal Power is all about helping guitarists learn to use and get the most out of some of the best guitar pedals on the market. If you would like to join up to GMI, simply click the JOIN UP button at the top of the page. If you would like to receive free lesson and notification updates then fill out the box on the right and bottom of most pages.